i've always really liked the fresh-faced look (Sofia and Gia Coppola, Kirsten Dunst, Michelle Williams come to mind), so that's what i aim for during the summer. mostly i focus on skincare and sun protection - i mean, if you have good skin at the end of the day, that means less need for make-up, right? these are my summer skincare essentials, with a few indulgent touches here and there. iconic ray-bans – can't leave home without them. Clinique super city block is my tried-and-true favorite: sheer tinted sun protectant that's oil-free and has high-enough SPF to actually make a difference. (note: if your skin type is on the drier side or you're not an oil-free devotee, Josie Maran's SPF 40 argan moisturizer is supposed to be fantastic – and a few friends swear by it.) now that it's getting hot and humid, i'm using the Bare Escentuals mineral sunscreen – love it as it also helps combat shine. Fresh clay mask is a lifesaver twice a week to deep-clean pores and rejuvenate my skin from summer in the city. it's also excellent to dab on as a gentle overnight spot treatment. (tip: shake the tube a bit to even out the consistency.) one tube has lasted me over a year, so even though it's pricey, it's really worth every penny. in my bag, i always carry Clinique concealer, Fresh lip balm, and Boscia blotting papers (my favorite is the green tea). as a luxurious extra, i also bring Jurlique's rosewater mist – especially good as a mid-day refresher, or as a quick touch-up while i'm on the road. My skincare essential is Olivia Care olive oil soap. I WILL NOT wash my face with anything else--and yet, when I use it, I find I really don't need to do anything else to my skin. Plus, it's dirt cheap so I keep bars of it everywhere I have to wash my face: my parents' house, my house, my best friend's house... The other weird life saver in my life are foods: sea salt and honey. I exfoliate with sea salt and basically use honey as a moisturizing face mask as well as spot treatment. I feel bad sometimes because my skincare products aren't in nice packages and I will probably die of embarrassment if anymore people ask why there is food in my bathroom! But, I've tried a lot of skincare products and the nice ones with the pretty labels always work well...until something shakes up my hormones--and then my skin just becomes like a whole different person! But olive oil soap, salt, and honey never fail no matter what! Ooh that Fresh mask sounds good. My summer skincare essentials include La Roche Posay Effaclar face wash, Photoban sunscreen and whichever eye cream I am trying at the moment. I use Avene's Diacneal on any spotty/clogged areas of my face. I also apply my Keracynl face mask twice a week to exfoliate and de-clog my pores. Besides that I love using Mysore sandalwood soap and a fabulous tamarind and cane sugar scrub by Forest Essentials in the shower. And Moroccan oil to protect my hair. Tom Ford sunglasses shield my eyes. And I always carry a lightweight scarf to protect my neck and collarbone area. it really is - now that it's getting humid and kind of icky here in SH i'm using it a few times a week to refresh and de-clog my pores! the mask has a lot of high reviews on sephora, hmm... I've heard so many good things about Cetaphil too. My skin is a train wreck right now, but my fault for not eating properly. I admire RayBans on other people, but they never fit my face right. My dad has a pair of tortoise shell RayBan wayfarers though. They look good on him, but personally I don't care for it. yes, the mask is fantastic - you should try it! and yeah Cetaphil is just the best. my skin is somewhat sensitive and i've tried plenty of drugstore and high-end (shiseido) cleansers, and Cetaphil cleanses really well but is still gentle and non-drying, not to mention inexpensive. Ooh, would love to try that Fresh mask when I finish up my current tub from Kiehl's...it's good but sometimes it's just fun to try different things. I've given up on finding the perfect moisturiser with SPF, and have settled down on using my usual moisturiser from Aveda with suncreen from Biore over that - the Biore sunscreen is cheap, no white cast, NEVER gets greasy, and it really protects the skin; I was once under the hot sun for 2 hours, and my unprotected shoulders burned, but my face didn't. I don't wear any other make-up except for MAC concealer from time to time. Oh, and sunglasses! I'm a big fan of the Jurlique scrub - my skin gets clogged so much from the humidity and pollution. It's very gentle but very effective, and the feeling of the grains pressed onto skin feels like a massage. Also, it smells like breakfast. I'm on the lookout for a good body lotion for hot weather...any recommendations? hmm i like Boscia and Jurlique for their skincare lines and lotions. both use natural ingredients and i think Fresh also has some great moisturizers. the Fresh clay mask is so good - definitely try it! i pretty much stick to the same skincare regime year round. i use some sort of sensitive skin cream cleanser (clarins and collective wellbeing are my two favorites, cetaphil is a close runner up) twice a day, and follow up with aesop parsley seed toner and serum. 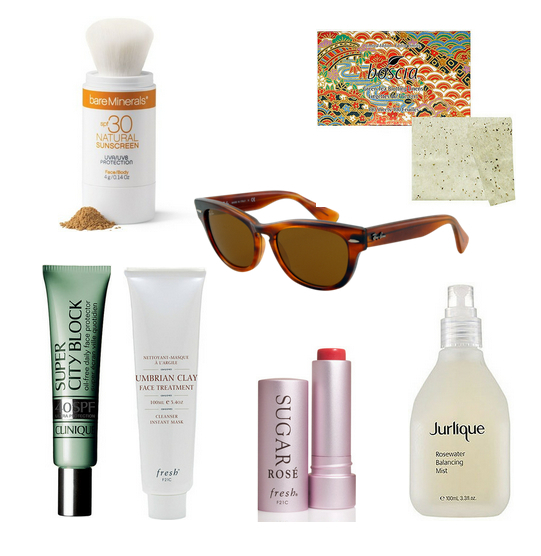 i also use aesop's primrose hydrating cream, and la roche-posay 45 spf sunblock. every other day or so i'll wash my face using the clarisonic mia. sometimes i'll use a brightening serum to even out blemish scars. if my skin is feeling really dry, i'll wash with a face oil or add a few drops of argan oil to my moisturizer. i'm also a huge fan of the sugar lip balm. i just got the coral color and it's really lovely! i know i have to check that out when i'm back in the US. they keep coming out with yummy new colors each season! I love these posts and it's equally fun to read all of the responses. It's suppose to feel like 110 degrees in NYC and it was 90 degrees plus yesterday- so less is more. It's just about keeping your skin looking fresh, hydrated and putting on sunscreen at that point. Cetaphil is the best. i'm glad you're a fan too! The fragrance on the Josie Maran 40 SPF is so strong and noxious it makes my eyes bleed. It's so unfortunate because I want that SPF and my skin wants those oils! I can happily recommend my current drier-skin-friendly sunscreen as a less smelly alternative: La Roche Posay's Hydraphase UV. It's got 25 SPF, it's got UVA/UVB protection, and it's a full-fledged dry-skin moisturizer in its own right, so one less product for me! I also use LRP's Anthelios sunscreen for body. My skin is super dry and I live in an extremely variable climate (subzero winters, 30c/90f summers), so I definitely can't have one skincare routine year-round. In the winter I need super-heavy creams and concentrated oils; I've learned the hard way that any product that says "oil free" is like putting poison on my face.